Today I wanted to provide some advice for the folks considering a new enclosed swimming pool. I am going to keep it brief and hopefully in plain English. 1. My first rule is to consider the size of your new pool, the larger the pool, the more enclosure you will need and the more cash you will have to lay out to get the job done right. Smaller pools cost less and can be enclosed with a much smaller budget. 2. The prices are all over the board so do some research and consider what you get for the investment. Quality is very important as your enclosure will be exposed to pool chemicals and harsh environmental conditions so it needs to be built out of materials that can withstand these environments. One way to cut the cost of your project is to plan your pool and enclosure together so you can combine things like foundations, electrical, gas service, landscaping, etc. all done once and not twice. Why pay twice to have electrical service run for the pool and then again for the enclosure when it can be planned together. 3. When choosing an enclosure, talk to others that have enclosed pools to see what they like and dislike about their enclosure. See what they would do different if they could start over and do it again. These answers always surprise me. 4. Remember, most insurance companies will not cover a loss on a building that was not engineered (engineering stamp) and built without a building permit. If they do cover some of your loss, it may be a figure more like 40% or less of your actual loss and rarely enough to fix the damage. 5. Rule five: You get what you pay for! The good quality buildings these days are found in strong aluminum alloys, glass seals, buildings that are thermally broken or insulated from the exterior environment, a good warranty and the service you can expect from your contractor if you do have an issue. 6. We always recommend that you provide a pool cover to keep the water in your pool when you are not using your pool. A cover will help you manage humidity, save water and keep your pool clean and safe. 7. Heating and ventilation are another important item to consider. Many buildings have features like retractable or partially retractable features. Keep in mind that any time you have a feature like this you need to consider how does it close and how does it seal out the wind and snow? 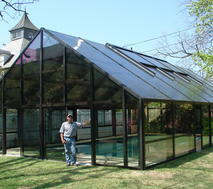 Many enclosures on the market look cool and are just as cool or cold in the winter and can cost a fortune to heat. e. last but not least, contact as many of their customers as you can and ask how they felt the job went and it they would recommend them to you to do your job!!! 10. Remember, your enclosure will become a year around playground so consider the whole year, Winter – Summer when planning as some seasons you will have your enclosure open to the outdoors and others you will be keeping it out. Please feel free to call me directly if you have questions about any of the above. Thanks for taking the time to read this!